For all its simplicity, pizza is a marvel of culinary engineering. It can be topped with anything. You can eat it without dirtying a plate. And most versions come with a built-in handle courtesy of the crust, which some (correct) people think is the best part. What many don’t realize, though, is that the crust can serve as an unexpected MVP of the edible Swiss Army knife that is pizza, and all it takes is a little bee juice. This isn’t exactly a secret, mind you. 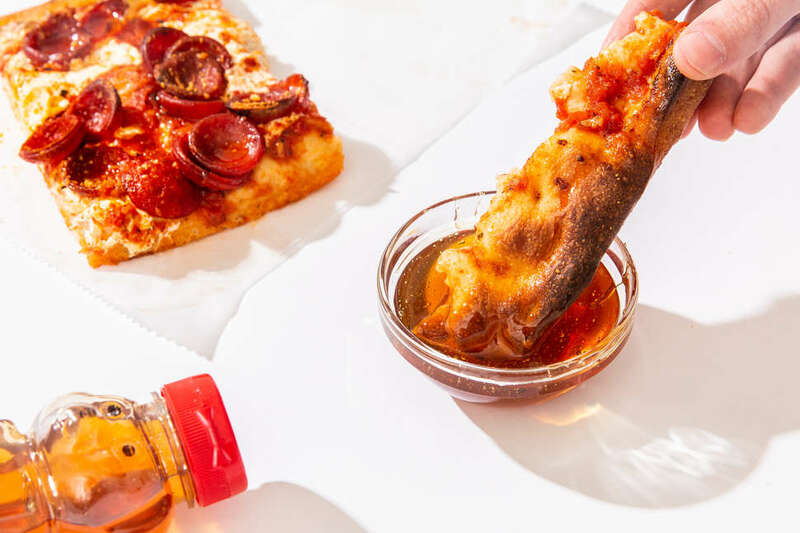 For folks in areas of Colorado, Kansas, Missouri, and Iowa, the idea of covering pizza crust in honey is simply the norm. Outside those areas, though, it's certainly not. That’s kind of the beauty of pizza: What you grew up with is the normal. More than almost any other food, the ideal of pizza changes from city to city and state to state. Put Provel on pizza in St. Louis and you're just eating pizza. Throw sauce on top in Chicago or bake it in a square pan in Detroit and nobody will make a peep. Do those things elsewhere and you're toeing a line between trendy and sacrilege. That's largely because the love of pizza swept nationwide so rapidly over the course of a century that many areas put their own stamp on it right away, and quirks quickly become customary to those who grew up with them. Honey on crust is one of those things, and it makes perfect sense when you think about it. You’ve got a fluffy hunk of bread absent of the savory stuff that preceded it. And while the common move in the heartland is to dip everything in ranch, making the crust a built-in dessert is a logical end point, one that made the already value-driven meal of pizza even more well-rounded for families. This isn’t a trend. It’s the norm for many a pizzeria, from The Wheel and Pyramid in Lawrence, Kansas to Great Plains Sauce & Dough Company in Ames, Iowa, and Joe’s Pizza Buy the Slice in Kansas City, Missouri. Those in the know definitely trace the practice to the '70s, when pizza more or less achieved permanence in the American diet. And many pinpoint the beginning of the practice to Idaho Springs, Colorado, where Beau Jo’s has been slinging its legendary Colorado Mountain Pie (TM!) since 1973. Beau Jo’s is a place steeped in excess: Founded in 1973, it’s a joint that sells its pies by the pound, and the colossal discs are anchored by a thick, wall-like crust that could be considered a small loaf of bread unto itself. According to founder Chip Bair, the addition of honey happened organically enough: The restaurant always used honey in lieu of sugar in its crust. Then, one day, a little honey bear fell on the crust Chip was eating and the "voila" moment happened. Ok, no, not that. But it’s still kinda cute. And with that, honey became as synonymous with Beau Jo's as developing massive biceps while lifting slices. Bair concedes that the practice kind of digs into dessert revenue at Beau Jo's, which might at least partially explain why big chains aren't handing out honey packets, instead trying to transform crust into cinnamon bread or other dessert pies. “We do sell some desserts, but probably not as many as if we didn’t have a built-in dessert,” Bair says. Whether Beau Jo’s is the originator, it’s certainly the biggest proponent: The restaurant’s condiment spread includes bottles of honey, and the company went through some 27 locally sourced tons of it at last annual count. Given the size of the crust, it's applied in many ways, from dunking to saturation. It's an addictive practice, and one that draws stares for folks who grew up doing it when they ask for a honey bear elsewhere. “I get people commenting to me about how they’ve been someplace else in the world and asked for honey for the pizza, and people always look really strangely at them,” Bair says. 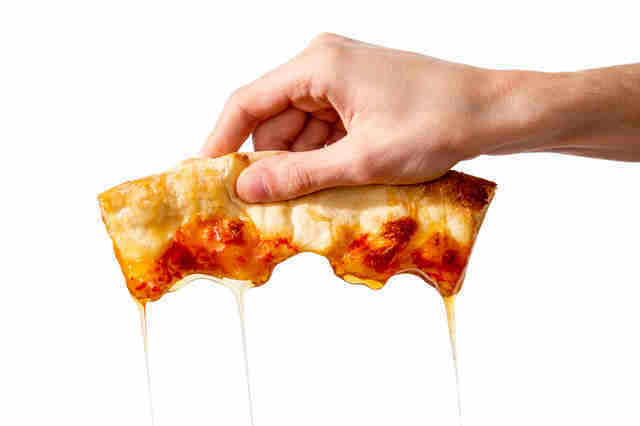 And yet honey has found its way throughout the country, particularly in Missouri and Kansas, where a bevy of local institutions have carried on the tradition of offering packets with takeout and squeezable honey for pizza. In fact, the heartland is well ahead of the trend of putting honey all over pizza, something that high-end wood-fired pizzerias have adopted along with kale and eggs, and Brooklyn's Mike's Hot Honey has made a killing on When it comes to full pizza efficiency, restaurants in the Midwest, the Rockies, and buried deep in the Pacific Northwest might just be giving a run to big-city places that begrudgingly give people ranch to gussy up their pizza bones. In the college town of Lawrence, Kansas, honey-drizzled crust is a way for budget-driven students to maximize their pie. And in Kansas City, Joe's Pizza Buy the Slice has carried on the regional tradition of honeying-up its "pizza for adults" since opening in 1991, with customers going the extra mile and using it as a means to turn crust into dessert and to add a little sweet to the pizza's slightly spicy sauce. Granted, it doesn't work on every kind of pizza. The very presence of crust is essential. Pies like Detroit-style where the crust is coated with caramelized cheese don't really lend themselves to the practice, and you might just get slapped for asking for a side of honey in the deepest recesses of New York. But in most cases, if you've got pizza bones and a packet of honey, you've got yourself an unexpected dessert on the cheap. Thrillist senior editor Andy Kryza prefers his pizza -- honey-coated or not -- with a glass of milk. Follow him to scorn @apkryza.